This category contains both pressure cooker pasta IN sauce and pasta JUST sauce recipes. It’s tricky to pressure cook pasta, but not impossible. 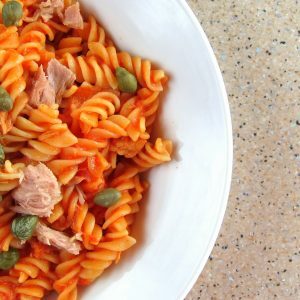 Using the hip techniques and recipes you’ll find that pasta remains al dente –perfectly cooked- and the flavor is bolder and stronger – as the pasta absorbs the sauce no just water. You’re going to use less water – just what the pasta absorbs. Plus, you’ll need less clean-up – put the sauce pot, strainer and other gadgets away. You won’t need them. No Mess – You can cook the sauce and pasta together. When you pressure cook a pasta sauce, compared to conventional cooking, the sauce is more quickly and evenly infused with all of the spices, herbs and ingredients giving you more flavor in less time.